Viva la dolce! : Dolce To-Do ~ June List! Dolce To-Do ~ June List! It's June! Pretty soon school will be out, and summer vacation will begin - a time for fun-filled days in the sun and late nights under the stars. For ideas on how to pass the time before summer vacation officially starts, check out the list below! 1. 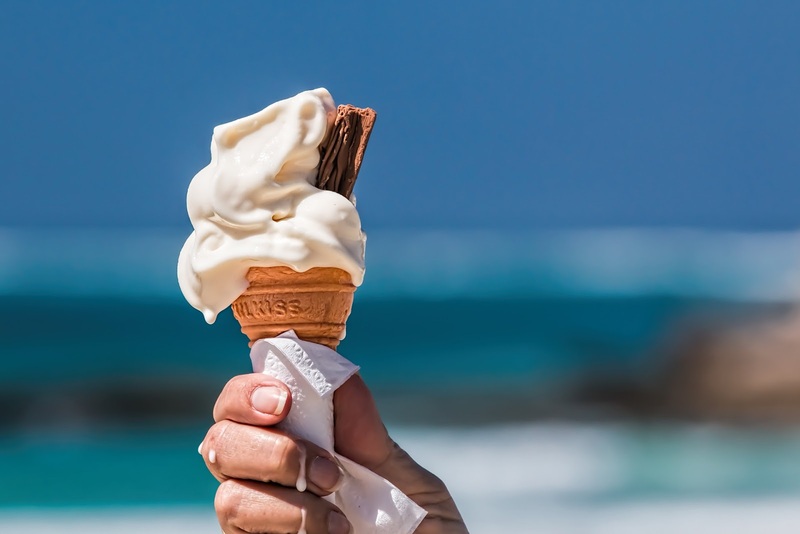 Enjoy some ice cream outdoors: There is something special about enjoying fresh, cold ice cream under the blistering, hot sun. Let's not forget the best part - racing to lick the melting ice cream before it drips! 2. Organize a backyard BBQ: Eating "al fresco" (outdoors) on a nice summer day is always a treat! Call up friends and family and invite them over for some delicious eats off the grill, or have them bring along some dishes of their own to share, potluck style! 3. Celebrate dad: This month the spotlight is on dad. Set aside some time to show the dad in your life just how much you care and appreciate him. 4. Take up an outdoor activity: Whether it's a new exercise routine or a new sport you want to try, take it outdoors! Now is the time to take advantage of the good weather and soak in some vitamin D.
5. Visit an outdoor fair: You don't have to be a kid, or have kids, to enjoy a good ol'fashioned outdoor fair. Enjoy all the fair classics like the Ferris wheel ride, the games and of course, the treats (did someone say funnel cake?)! 6. Refresh your car: With the winter long gone, and spring showers safely behind us, it is time to get your car summer ready! Whether you like to do the dirty work yourself, or hand the job off to an auto cleaning service, now is the time to get your car squeaky clean and sparkling for some summer fun! 7. Make some freezer treats: Nothing is better than a cold, refreshing snack on a blistering, hot day! Prepare for those days now by arranging a variety of yummy snacks and freezing them. Some ideas include: frozen grapes, fruit slush freezes, and frozen banana pops. Check out this list for more ideas! 8. Organize and file: With the school year coming to a close, there are sure to be lots of notes and assignments that risk being left in a corner somewhere until September. Invest in some great organizers (for example: file folders, filing cabinets, bins, etc.) to help ease this problem and to also preserve some of your children's favourite school memories. 9. Make some time for you: June is one of those months that can sometimes feel a little frazzled. Whether you have kids finishing up their school year, or you are preparing to leave for summer vacation, you probably feel like there is a quicksand timer on your shoulder, while you are trying to get all the last minute things done before the month's end. Try and carve out some down-time between all the "to-dos" to avoid burnout, before the summer months arrive! 10. Watch a foreign film: During the month of June, the annual Italian Contemporary Film Festival in Toronto brings you authentic Italian cinema at it's finest! With a variety of fun events, star guest appearances, and an array of Italian films, you're sure to be entertained, and learn a thing or two about Italian culture!